1867 : Birth of Hector Guimard in Lyon. 1882 : Studies at the “Ecole des Arts Décoratifs” in Paris. 1885 : Architectural studies at the “Ecole des Beaux-Arts”, but Guimard never obtains his degree in architecture. 1888 : First order for a restaurant and café-concert in the Paris 16th district, Au Grand Neptune. 1889 : Pavilion of Electricity, closed to neo-Gothic style, at the World’s Fair in Paris. 1891 : Designs the Hôtel Roszé, 34 rue Boileau, Paris. 1893 : Builds the Hôtel Jassedé, 41 rue Chardon-Lagache, Paris. This edifice reveals Guimard’s attention to the mixing of building material, such as millstone, stone and various types of brick. Using different window shapes, Guimard expresses movement on the facade. 1894 : Travels in England and Scotland. Guimard is interested in designing cottages. 1895 : Designs the Ecole du Sacré-Coeur, 9 avenue de la Frillière, Paris. This project is not far away from Eugène Viollet-le-Duc theories (a great French theoretician of architecture during the second part of the 19th century). Travels in Belgium and meets the architect Victor Horta, who created in 1893 in Brussels the Hôtel Tassel, first Art Nouveau building. Begins the Castel Béranger project, 16 rue La Fontaine, Paris, an investment property ordered by Elizabeth Fournier. It is a turning point in Guimard’s career. In this construction he rejects symmetry and flatness. For Guimard, the facade must express volume and inside organisation. 1896 : Villa Berthe, also called ” La Hublotière “, Le Vésinet. 1898 : Publishes The Art in modern housing. The Castel Béranger. Work of Hector Guimard, including inside and outside representations of the Castel Béranger. Indeed Guimard also takes over the interior decoration: furniture, wallpaper, mosaics, stained-glass windows, chimneys. In Lille he designs for the ceramist Louis Coilliot a building including shop and housing. The astonishing point is the depth and space in the upper floors. 1899 : Guimard gets a gold medal for the Castel Béranger in the competition of Parisian facades. Exhibition about the Castel Béranger and lecture by Guimard at the newspaper Le Figaro’s rooms. At the occasion, Guimard declares : « I love architecture, and I love it because in its essence, expression, function and all its achievements it includes all the other arts, without exception”. Designs the Castel Henriette in Sèvres (widened in 1903, destroyed in 1969) with a remarkable turret-keep. Creates the Villa La Bluette in Hermanville (Calvados), a construction in a norman housing spirit with its blue wood panels. Builds the tomb for family Cailliat at the Père Lachaise cemetery in Paris, an Art Nouveau funeral art creation. 1900 : For the Paris World’s Fair, projects and models for metro (subway) entrances, made of cast-iron, glass and enamelled lava. Guimard participates in the World’s Fair with differents creations concerning interior decoration : furniture, wallpaper, stained-glass windows, carpets, chimneys, vases and perfume bottles. 1901 : Opening of the concert-hall Humbert de Romans, 60 rue Saint-Didier, Paris, in which metals experiment with balance. 1902 : Financial problems between Guimard and the subway company. The architect stops working for the company, even though it still uses Guimard’s kiosks until 1913. 1903 : Shows a pavilion called ” The Guimard’s style ” at the International Exhibition on housing in Paris. Edition of 24 postcards representing his works given as ” Guimard’s style “. Designs the Castel Val in Auvers-sur-Oise, built of reinforced concrete cement and adorned with stoneware made by the ceramist Bigot. Erects the villa La Surprise in Cabourg. 1904 : Hôtel Nozal, 52 rue du Ranelagh, Paris. 1905 : Investment properties, avenue de Versailles, Paris. 1908 : Le Chalet Blanc in Sceaux. 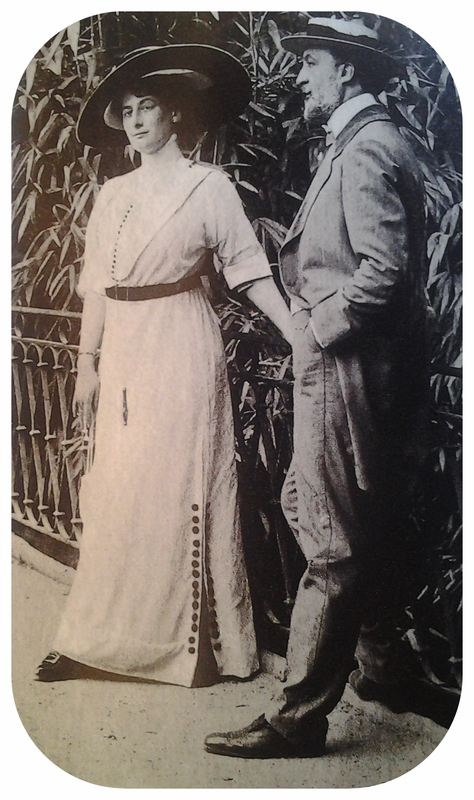 1909 : Marries the painter Adeline Oppenheim. Projects for his Hôtel, 122 avenue Mozart, Paris, including the architect agency on the ground floor and private rooms with a workshop for his wife on the other floors. Guimard also designs the furniture and elements inside. 1910 : Hôtel Mezzara, 60 rue la Fontaine, Paris, ordered by an industrialist in textile Paul Mezzara. The inner lobby is lighted up by a colorful glass roof. Today the Hôtel Mezzara still kept the interior decoration created by Guimard and in particular the furniture of the dining room. 1911 : Apartment buildings, on the streets Agar, La Fontaine and Gros, Paris. 1913 : Synagogue, 10 rue Pavée, Paris, where Guimard uses reinforced concrete cement. 1920 : Settles patents for standardized pavilions construction. They allow a faster assembly directly on the site without using special equipment or workforce. 1921 : Project for an Hôtel, 3 square Jasmin, Paris, built of standardized elements. 1925 : International Decorative Arts Exhibition in Paris. Guimard participates in it with the town hall of the French village, made of standardized elements. 1926 : Apartment building, 18 rue Henri-Heine, Paris, where vertical run-up is clearly underlined. Guimard moves into one of the apartments from 1930. 1927 : In Paris, the kiosk metro station Etoile, designed by Guimard, is dismantled. 1929 : Gets the Legion of Honor, a great French distinction. 1930 : La Guimardière, Guimard’s home in Vaucresson, built of brick and cement tubes. 1938 : Guimard moves to New York with his wife. 1939-45 : World War II. At the beginning of the 1940’s, destruction of Guimard agency’s archives in Paris, because of a protection decision which orders to eliminate any flamable element in case of bombardment. 1942 : Guimard dies in New York. 1948 : Mrs Guimard offers the French state the Hôtel Guimard has build in Paris, 122 avenue Mozart.The French state refuses it. 1960 : Exhibition The origins of the 20th century – The Arts in Europe from 1844 to 1914 at the Paris Museum of Modern Art. 1962 : The kiosk metro station in Bastille, designed by Guimard, is dismantled. 1970 : Exhibition about Hector Guimard at the Museum of Modern Art in New York. 1971 : Exhibition 20th century pioneers – Guimard – Horta – Van de Velde at the Decorative Arts museum in Paris. 1992 : Exhibition Guimard at the Orsay museum in Paris.